Qi (chee) is Chinese for air, or energy, while Gong is “work.” One moves and harmonizes life energy, moving through universal energies, balancing and healing the mind, soul and body. Through meditation, exercise and harmony of mind and body, Qigong applies the energies of the mind and body to ensure health and wellness. While Western Medicine claims perfection using chemicals and invasive treatments, Chinese medicine is a much older, wiser style of medicine, going back millennia, through the Daoist and Buddist traditions and further. This is not to say that Western medicine doesn’t have it’s place. As a Stage IIIb cancer survivor I was not adverse to using every bit of Western medicine I could in order to overcome the horrors of cancer. Of course, the Western medicine was horrible in and of itself. But it did the job, for which I am eternally grateful. But meditation, massage, acupuncture and other, older forms of healing also played a big part in my healing. And honestly, though Qigong was not part of my healing, if I had found this book sooner, I feel very much that this too would have helped immensely to provide balance and help me to manage my pain and weakness during my chemotherapy. I spent quite some time reading though Meridian Qigong and was very comfortable with the practice. Now, honestly, I intend to keep this book on my Nook and start actually practicing Qigong, with the help of Tevia Feng’s lovely little book. 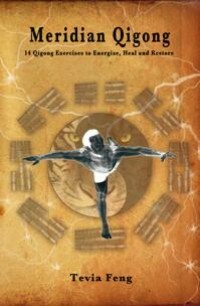 Only 120 pages long, the book is a wonderful introduction to Qigong. I hope you enjoy it as much as I did. Check it out – the practice of Qigong may be perfect to help you to balance your mind and body. I received this book form the publisher in return for a realistic review. All thoughts are my own. How interesting. Will definitely be looking into Qigong and checking this book out. I used to spend quite a bit of time practicing various types of meditation and exercise, but I have truly fallen off lately. I am hoping this will help me get myself back into balance.